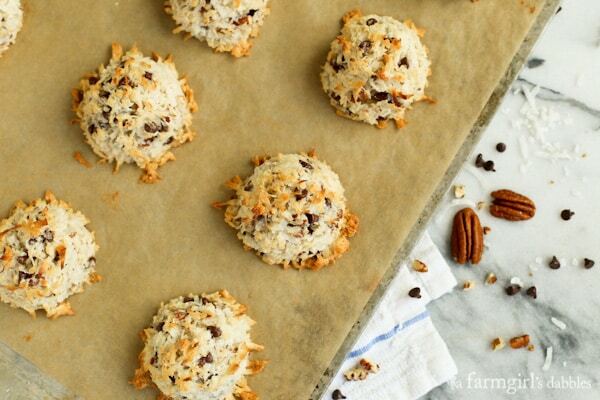 These German Chocolate Macaroons are for Dad. Each year, Mom bakes him a German chocolate cake for his birthday, slathered with that awesome sticky coconut-pecan frosting. And each March since this blog was born, I’ve been sharing German chocolate treats in his honor. First there was the traditional three-layer German chocolate cake that Mom always makes. This was followed up with layered German chocolate cupcakes and an easy peasy German chocolate sheet cake. And then last year I deviated from tradition with some pretty amazing black licorice caramels, since my dad is such a black licorice fan. He’s always trying to push that stuff on his kids and grandkids. :) I packed up a tin of caramels and mailed them to Dad last year while he and Mom were enjoying some sunny warmth in Florida. The caramels were a hit. This year I returned to the customary German chocolate, but this time in the form of macaroons. My family went crazy for these German chocolate macaroons. CrAzY, I tell you! Hatti took a few to junior high, to share with girlfriends at the lunch table (and I’ve heard from certain young sources that they were amazing). And I packed up a small box of macaroons and mailed them to Dad and Mom, in Florida again this March, for an early birthday treat. It was fun to receive their texts of smiley emoticons, thankful for the homemade gift. So, as you just learned, these macaroons have already been thoroughly tested for you. There should be no question in your mind. Make some! When I set out to make these German chocolate macaroons for my dad, I had the vision of a local bakery’s macaroons in my head. 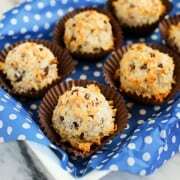 Salty Tart is famous for their macaroons, sweet and super dense, and mounded so perfectly. That mounded profile was what I was hoping to achieve, combined with the flavor and consistency of the macaroons that my mom has always made. It took me a couple tries to get the consistency just right – to match the flavor and moistness of Mom’s macaroons with the mounded glory of Salty Tart’s. But when I did…it was obvious macaroon perfection. I wrapped the macaroons individually in plastic wrap, nice and tight, and then packaged them in a small box cushioned with blue and white polka-dotted tissue paper. A note to Dad and Mom was tucked inside, and then those beauties were mailed off to Sarasota. From their perfectly crisped outer shell, so pretty and tempting, to their incredibly moist and dense insides, these macaroons just can’t be beat. Especially when a little chocolate and pecans are folded into the mix. In a large bowl, stir together coconut, sweetened condensed milk, and vanilla. Then stir in the pecans and chocolate chips. 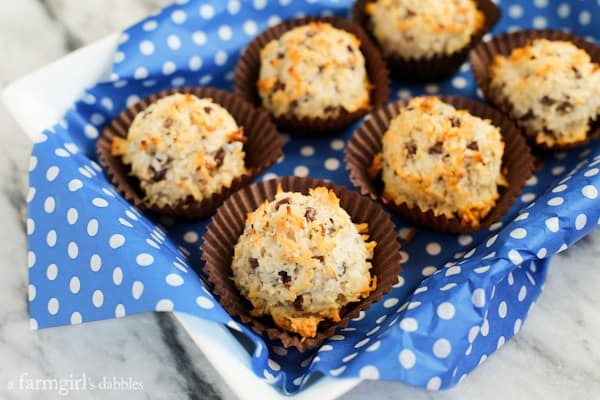 Sprinkle the flour over the coconut mixture and fold to incorporate. In the bowl of a stand mixer fitted with the whisk attachment, whip the egg whites and salt on high speed until there are medium-firm peaks. Very gently fold the whipped egg whites into the coconut mixture. 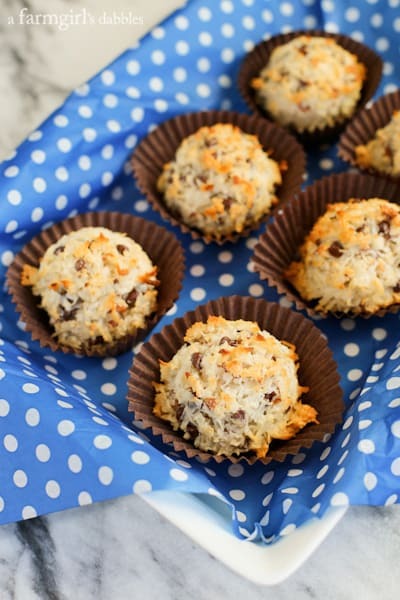 Using a 2″ diameter cookie scoop, pack the coconut mixture fairly tightly, and drop the batter onto prepared baking pans. Bake for about 35 minutes, or until golden brown, alternating pans halfway through baking if baking both pans at the same time. Cool on the pan for 5 minutes and then remove macaroons to a cooling rack. 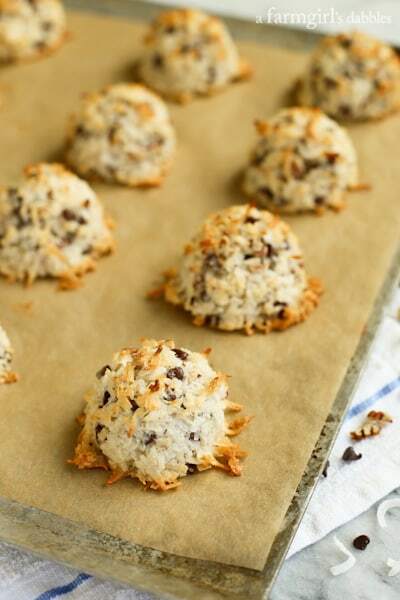 Recipe adapted from a coconut macaroon recipe that Mom always makes, plus this one from Ina Garten.